A page from the 1934 scrapbook of newspaper clippings from the Arkansas City (Kansas) Traveler. The scrapbooks were created by local Red Cross volunteers. Articles during the Depression years covered food and other relief efforts, and documented unemployment issues. Arkansas City (Kansas) Traveler, “1934 Red Cross Scrapbook: page 75,” Digital Arkansas City, accessed April 24, 2019, https://arkcity.digitalsckls.info/item/124. The children at the Legionville preventorium near Coffeyville received a thrill when they were visited the other day by Santa Claus. 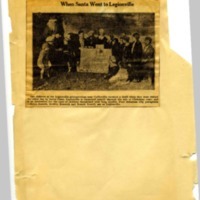 Legionville is supported largely through the sale of Christmas seals, and is an institution for the cure of children threatened with lung trouble. Four Arkansas City youngsters —Helen Hainds, Wesley, Kenneth and Donald Nowell, are at Legionville. Newspaper clipping on scrapbook paper.